The passion play of Iztapalapa is unlike any other in Mexico. Held each year during Holy Week, the event in the Iztapalapa district of Mexico City is one of the oldest and most famous passion plays in Mexico. The origins of the event is also unique: It began 171 years ago during a cholera outbreak. A procession to petition relief evolved over time to include a passion play with scenes related to Holy Week. Today, the passion play features a cast of thousands, including men called “Nazarenes” who follow the actor playing Jesus. 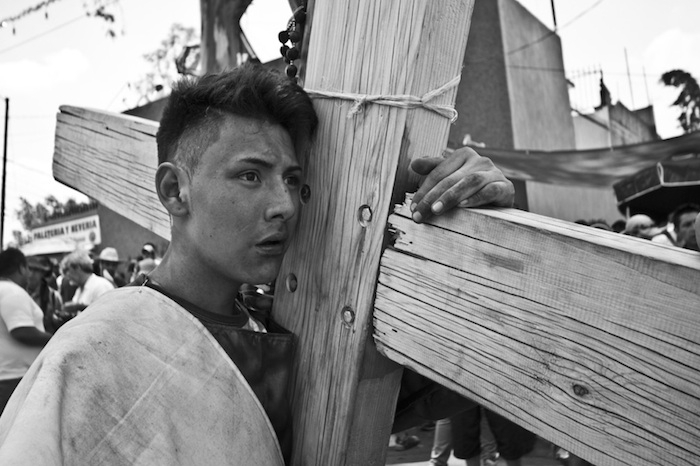 “From then until now, the representation incorporates new elements each time,” says Mexico City-based photographer Juan Carlos Lelo de Larrea, who documented the passion play of Iztapalapa on Good Friday of 2014. His work was later selected as a winner of the Latin American Fotografia 3 competition. A veteran photographer, Lelo de Larrea majored in communications at the Universidad Iberoamericana, graduating in 1998. In 2000, he established an audiovisual production studio and has had his work featured in a number of exhibitions, including a solo show, “Comercio en Chino,” at Galeria Primate in Mexico City. His LAF-winning work was also included in the “Los Diaz” traveling exhibition sponsored by Epson. His commercial clients include InStyle and Elle magazines, Proctor & Gamble, L’Oreal, Danone, Nestle, Banamex and Microsoft.